I love the introduction to the page which really captures what we all think, at one time or another. Genealogists are always in search of new record sources when confronted with a brick wall. Well, can you think of a resource that not only gives you name, address, age and occupation, but also height and weight of a person? Interestingly, the ration books issued during World War Two attempted to capture* these items. Currently the collection includes over 11,000 entries and there is a nice search feature. Though my father’s family is not yet found listed here (Acey in Salem MA), more than likely they did receive rations. My father’s father and several grandparents all died before 1945 and I know that the family lived in pretty dire circumstances. And, that didn’t stop me from looking around and boy are these neat! I did NOT “really” appreciate their existence until I started looking around here. 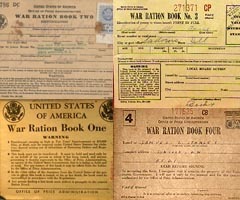 And, there is a nice series of article links where one can learn about ration books! Have you tracked your family through ration books? Did you make any neat discoveries? Always like to hear about what readers have found! Editor’s Note: The Ames Historical Society has a nice online exhibit about Ration Books etc during WWII as does the American Centuries site. Yes, I have a nice collection of ration books from my grandparents, parents, aunt and uncle. It gave me an exact address for the uncle in a period when we knew only that he was living somewhere in New Jersey. Having the definite address led to census and other records. How neat -- my family wasn't big on "saving" anything ... and so this was the first time that I really appreciated rationing in a genealogical context! Thanks for sharing. I think the comment about the ration books is in error. Having lived through this time, and refreshing my memory, I believe the ration books were issued to all. They were deemed necessary in order to distribute short supplies of all kinds of things during WWII. All kinds of production facilities were turned to production of war materiels, so general consumer products were in low supply. Need to check the facts. I believe the ration books were not a "welfare" matter but an attempt to make sure that everyone or family had their fair share of what meat, etc., was available during the war. Many, many people were in dire circumstances - we were just coming out of the Depression. I have no ration books, but many ration tokens. I'm not much of an Internet explorer and didn't think to check Google, although a year or so ago I did learn that the tokens (smaller than a dime, blue and red having different values) were some kind of a wood substance. I think they were "change" from an incompletely used ration coupon.